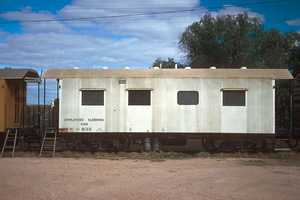 Broad gauge 35 ft. Webb Caboose Brake Vans built at the Islington Workshops. The standard bodies of these vans where 9 ft. 2 in. wide, 12 ft 6 in. high and 35 ft long. Vns 4384 to 4391 where built on narrow gauge underframes. 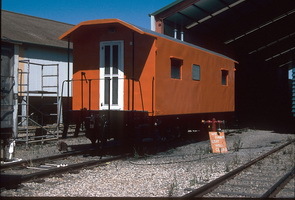 Webb Caboose Brake Van built at Islington Workshops. 6.1963 Entered service as broad gauge employees sleeping van. 5.1963 Entered service as broad gauge employees sleeping van. Webb Caboose Brake Van built at Islington Workshops. 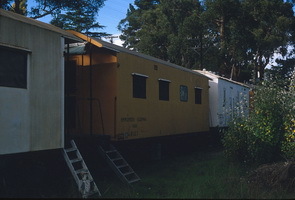 This Caboose had 2 windows + double doors on side and tanks on Roof. 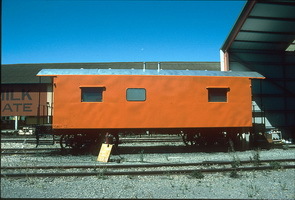 Webb Caboose Brake Van built at Islington Workshops. Only 2 windows on side, steel bracing, plain above end platform. Webb Caboose Brake Van built at Islington Workshops. Narrow-gauge underframe. Two Doors on side.